Ufugusuku nu Kun is a kata devised by Ōshiro Chōjo (1887-1935) in order to teach budō at the Okinawa Prefectural Teachers‘ College (Okinawa-ken Shihan Gakkō) and the Industrial School (Kōgyō-gakkō). In the prewar years, Chōjo together with Yabiku Mōden was considered the leading figure in Okinawa Kobudō. It is said that it was through his close relationship with Yabiku Mōden that Chōjo was introduced to Chinen Masanra of Yamane-ryū Bōjutsu, of which Chōjo became a distinguished master himself. Ōshiro Chōjo → Chinen Masami → Kishaba Chōgi and Higa Seitoku. Some differences in the kata and the way of handling the bō can be observed. Ushiro-zuki [except first lane] – Uke-kamae [except first lane] – Shōmen-uchi – Chūdan-zuki – Harai-uke – Shōmen-uchi – Gedan-uke – Shōmen-uchi. Naturally, the designation of the techniques might differ here and there. Technically, following every turn with Ushiro-zuki, techniques are issued quickly. In those schools that teach this kata it is often taught as the first bō kata and can be considered an introductory kata. However, with advancing skill level it is also an interesting performance kata. Today Ufugusuku nu Kun is taught and practiced in a large variety of schools, including Bunbukan, Shubukan, the Ryukyu Kobudo Shinkokai and various other schools as well as in Kyokushin. It is sometimes pronounced in its modern Japanese reading as Ōshiro no Kon. 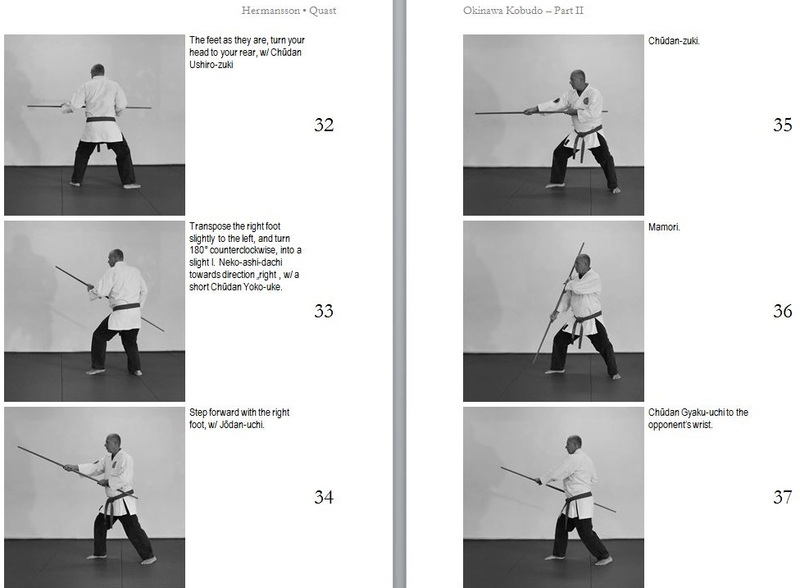 Ufugusuku nu Kun, from Hermansson/Quast: Okinawa Kobudo, Vol. II. Once you’ve learned each step, technique, and some applications, you can finally start to perform: like in this version of Ufugusuku no Kon from the Kubagawa Shubukan of Kinjō Masakazu. This entry was posted in Unknown Ryukyu and tagged Bojutsu Kata Series, Bunbukan, Chinen Masami, Higa Seitoku, Kinjo Masakazu, Kishaba Chōgi, Kubagawa Shubukan, Maeshiro Chotoku, Nakamoto Masahiro, Oshiro Chojo, Oshiro no Kon, Ufugusuku no Kon, Ufugusuku nu Kun, 大城の棍. Bookmark the permalink.